Yesterday was Jerrod’s 27th birthday. 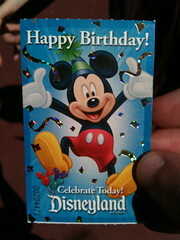 Since Disneyland is having the free ticket on your birthday promotion and I have an Annual Pass, we went to Disneyland. We had some lunch at Del Taco before Disneyland. 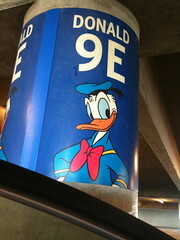 This entry was posted in Journal and tagged birthday, Disneyland, jerrod, pictures, video on August 9, 2009 by Shannon. My boyfriend, Jerrod, has been looking for a new job for several months. He’s talented and experienced in his field of game programming and design, but for some reason he hasn’t had many offers lately. Then this company in Newport Beach called him and they did a phone interview and that went really well. It turns out that his interviewer knew one of his references. So they called him in for an in-person interview. I was at VBS that day working in the pre-K class, and at the time of the interview, I almost sat my four year olds down to pray with me. I was praying for him, and for his interviewer, and I know that my grandparents were praying for him too. He finally called me to say that he was done, and it went really well. They took him out to lunch and he got to meet pretty much the whole programming team, and he liked them alot. The next day I was at VBS again, this time in the Kindergarden room, and at around 11am he texted me to say he had gotten an offer, and they had even offered him a little more than he asked for, which is great. When VBS was over, I went down to the nursery where my grandmother was and told her about the news. I think she was even more excited than I was! I think she would’ve jumped up if she hadn’t been holding a baby. “Do you know what this means?” She asked me. “That he’s going to move to Orange County?” I suggested. “How good is God?” my grandmother prompted. Yeah, God is good. If I didn’t know that already, I would have learned from this. The past few weeks have certainly been a testament to it. Not only that, but the lease on Jerrod’s apartment in Burbank isn’t up until March, so he would have had to pay to break his lease. By the grace of God, the company that owns his apartments also owns several others in the area he needs to move to, and he can just transfer his lease! I went with him a few days ago to look at the Huntington Beach apartments, and they’re really nice. There are lots of trees, the floorplan looked really cute, and there was one available on the bottom that had it’s window facing trees and stuff with a nice patio and really shady. An elderly lady lives there and is moving to assisted living, so it’s like, really clean and stuff. I just knew that was the one and I started jumping up and down telling him to get it right then. He put down a deposit, and ended up going back a few days later to sign the papers and make it official. He’ll be moving in the week of August 8th. If that weren’t enough, the same week he did the phone interview with his new company, I started getting lots of jobs too. A website needed hosting, and I offered them a good deal and help with the setup. Then a friend needed some logos made and his company liked them so much, I ended up doing some more for him. Then my mom’s friend needed some computer lessons, so I went to her house and gave her a session, and now I’m going back again on Saturday. This entry was posted in Journal and tagged God, good, jerrod, miracle, plans, thankful on July 27, 2006 by Shannon. We’re supposed to be leaving for our cruise today, but Jerrod can’t find his birth certificate and now we can’t go! Yes, my boyfriend’s company is taking everyone on a cruise leaving today. A weekend cruise to mexico, and we were all set to go, I even have my boarding passes and everything. But if you don’t have a passport you have to bring your birth certificate, and he can’t find his. He was looking all last night and all this morning and now it’s 1pm and we were supposed to start boarding at 1:30. I am so sad. We’d been looking forward to this since like last May. This was going to be my first cruise and we had an excursion booked to go see where they filmed Titanic, and It’s been raining like crazy here which is not normal, but I checked the weather and it’s not supposed to rain again all weekend. I got new pink luggage, and I’m all dressed in my new outfit, and now we’re not going. This entry was posted in Uncategorized and tagged events, jerrod, journaling on February 25, 2005 by Shannon. Jerrod and I did our celebrating on Saturday. We went shopping a little at Old Navy, and then went to a movie at the theater that’s across the street. We saw Finding Neverland. It was a really sweet movie and beautifully done, so that it was almost as good as a book. I cried. Of course, I cry whenever I read the Chronicles of Narnia. Jerrod got me a build a bear that’s dressed in a tux with a red bowtie and a cute little bouqet of flowers in it’s paw. Today, I recieved a second surprise when a bouquet of a dozen red roses and a vase were delivered. My bear looks so cute next to it. This entry was posted in Uncategorized and tagged holidays, jerrod, Valentine's Day on February 14, 2005 by Shannon. The other night, Jerrod was trying to make a character for his new mini-boss domain, and I was once again looking for a hack or plugin to use post icons in MT. We were both having little success when I suggested that we switch projects. So as it happened, I pixel painted a cute little flaming boss monster style guy for him, and he whipped up a nice little MT hack for me. Now I can use as many cute little icons as I want. I have never used custom favicons on my sites before. I don’t know why, I just haven’t, but I decided to give it a try. It turned out to be extremely simple and now you should be able to notice an icon of two little pink hearts in your address bar, bookmark list, or tab(if you’re using a browser with tabs of course). This entry was posted in Uncategorized and tagged jerrod, journaling, projects on January 3, 2005 by Shannon. Okay, so as mentioned in a previous post, my boyfriend and I are going to celebrate our 1 year anniversary on Saturday. It is actually the next week, but that is when E3 is. And that is something that Jerrod has to be at for work. So I have these hints for what my gift might be. I am a really good guesser when it comes to this, but this is a doozy. I even tried googling for answers. now, what could it be? We are also going to the aquarium, and to the spaghetti factory for dinner which is where we went on our first date. And we are going to go shopping. This entry was posted in Uncategorized and tagged anniversary, jerrod, journaling, surprises on April 30, 2004 by Shannon. 1. Side of the bed: Left or Right? well, I have a twin bed, but the right side of it is against the wall, so I guess you could say the left side. okay, so I’m glad that my blog is back to being updated. My uncle is in Japan on business, and I was spending the night with his daughter to take her to school and whatnot, and last night I wanted to blog and totally got errors. Very upsetting. But I fixed them, and now I’m back in… blogness. haha. I haven’t blogged for the last couple of days, partly because I’ve been learning php. I even wrote my first PHP script; Pretty Comments. It is my 1 year anniversary with my boyfriend. For his gift, I got him captainjerrod.com for his blogging. Won’t that be cute? He loves pirates. This entry was posted in Uncategorized and tagged anniversary, blogging, jerrod, memes, pirates, surveys on April 27, 2004 by Shannon. lots of things that seem simple are very complicated. this just seems like the best place to be. I was thinking about this Jars of Clay song called Hymn. My life, by captured fare you own. nor death shall not my steps beguide. For in your path I’ll run and hide. Jerrod is coming over soon. He was upset because he didn’t have a shirt that he wanted to wear clean, and his mom wanted him to go buy groceries, so I told him to put the shirt in the wash, and go buy groceries. put the shirt in the dryer alone and it should be done soon enough. I think it’s okay now, and he’s going to get groceries. This entry was posted in Uncategorized and tagged jerrod, journaling, lyrics, memes on March 27, 2004 by Shannon. Today, Jerrod was supposed to come over, but he had to work. He’s coming over now, but of course it’s not quite the same. But oh well. I went to my favorite Chinese resturaunt today, and I picked up my order and the lady said she should have known it was me because I ordered cream cheese wontons. She asked if I cook and I told her that I make good homemade macaroni and cheese – the from scratch kind. And she seemed pretty surprised, and asked about it, so I actually told her how to make it, generally of course. lol. But tragedy struck later this afternoon when the dogs ate the rest of my fried rice, which was most of it, as I don’t eat that much of it at a time. So now I’m looking forward to Del Taco when Jerrod gets here rather than the leftovers I would be having. Oh, well. I made some changes to the blog page today. I added a “members” section to the right and I joined a few webrings and such. Should be good. I also added a blinkies page down in the Shannon section. It opens as a popup. I made a whole lot of Winamp skins last night and today. I made S/S ones, and a beach one out of my photos, an Anne one, and some disney ones, and even a veggietales one. I think I’m going to add a skins section to my fanart site, and put them up there. I also have alot of Narnia skins and a Princess Diaries one that I’ve made. This entry was posted in Uncategorized and tagged Golden Choice, jerrod, updates on March 13, 2004 by Shannon. I haven’t blogged in a while. I’ve had a pretty icky cold, and I’ve been running a fever the past few days. I think my fever’s down now but I’ve been coughing alot since lunch. oh, well. I added some songs to my playlist. I’ve been reading lots of Seth/Summer fanfiction. for some reason it seemed like the most logical thing for sick me to do. Anyway, apparently this is Insomniac’s tenth anniversary. Jerrod just said that they were going to take everyone on a cruise! and of course I would get to come. I am really excited about it. I’ve never been on a cruise before. I already started thinking of the things I’d need to go shopping for. Jerrod laughed at that. and I told my roommate and I was saying “and of course I’d have to go shopping” and she started laughing. aw, well. Well of course, I’ll need a new bathing suit, and I want one of those board skirts, and I’ll need some new flipflops for the season and other sandals, and sundresses, and a new fancy dress for the dinner. This entry was posted in Uncategorized and tagged events, Insomniac, jerrod, sick on March 9, 2004 by Shannon.